Buying property is an intimidating process, which is why more Aussies are going online to find information, answers, and support before applying for home loans. Innovative research with GfK unveils Aussies’ real online behaviors to help marketers connect in key moments along the path to purchase. Especially for high-consideration items like college degrees or new property, consumers today spend a considerable amount of time researching their options online. Buying a home is an especially stressful process so Aussies leave few resources untapped, amounting to more than 450 unique moments where brands can show up and be considered. The path to purchase for home loans is more complex than ever, but marketers should be more excited than intimidated. As Aussies bounce between devices and interact with hundreds of online and offline touchpoints, there are more opportunities than ever for brands to reassure Aussies’ decision-making by being helpful and relevant to their needs. 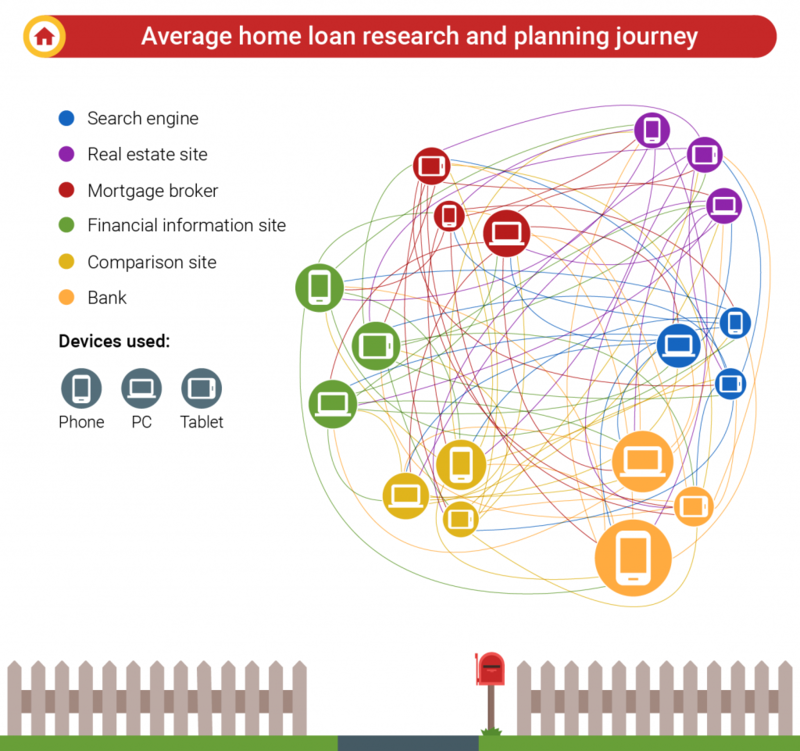 To help marketers better understand the real online behaviour of Aussies in the market for home loans, we embarked on a bold cross-device clickstream study with GfK.1 Over the course of eight weeks, we passively tracked everything that an opt-in panel of 341 consumers clicked, visited, and searched for in relation to their home loan purchases. Here, we’ll break down three key lessons and actionable takeaways for brands to win during the research journey. 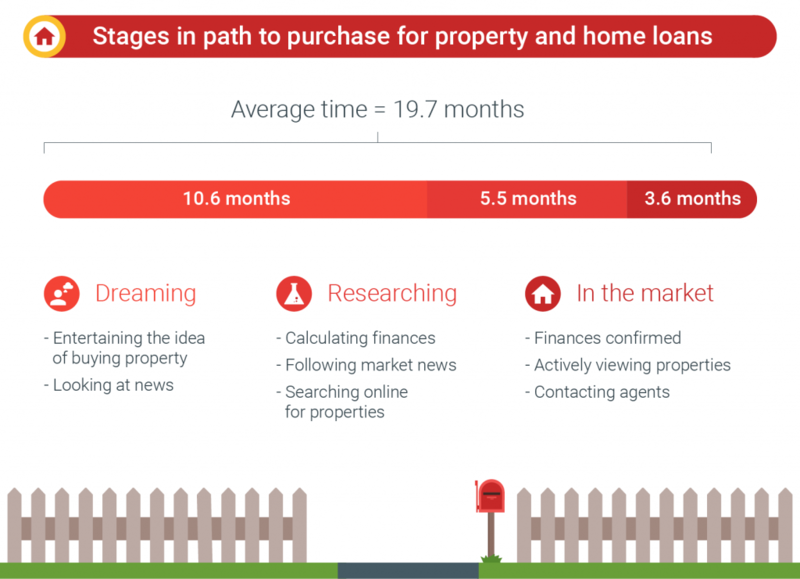 Buying a home is one of the biggest decisions in many people’s lives, so it’s no surprise that the path to purchase is one of the longest in any industry, taking nearly 20 months on average. A lot of people start dreaming about buying property nearly a year before they ever start to research different options. When Aussies are researching online, it’s no surprise that bank websites see the lion’s share of visits. But because home loans and property are intrinsically connected, real estate sites receive a near-equal share of visits. Online search plays a crucial role by serving as a launch point to all the information consumers need to make informed decisions. 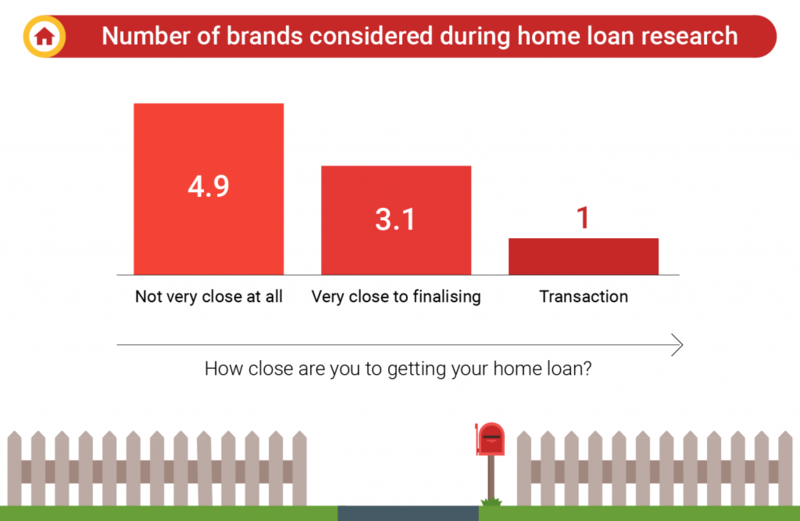 There are a huge number of previously unseen opportunities for brands to have an influence long before the visible home loan research stage begins. 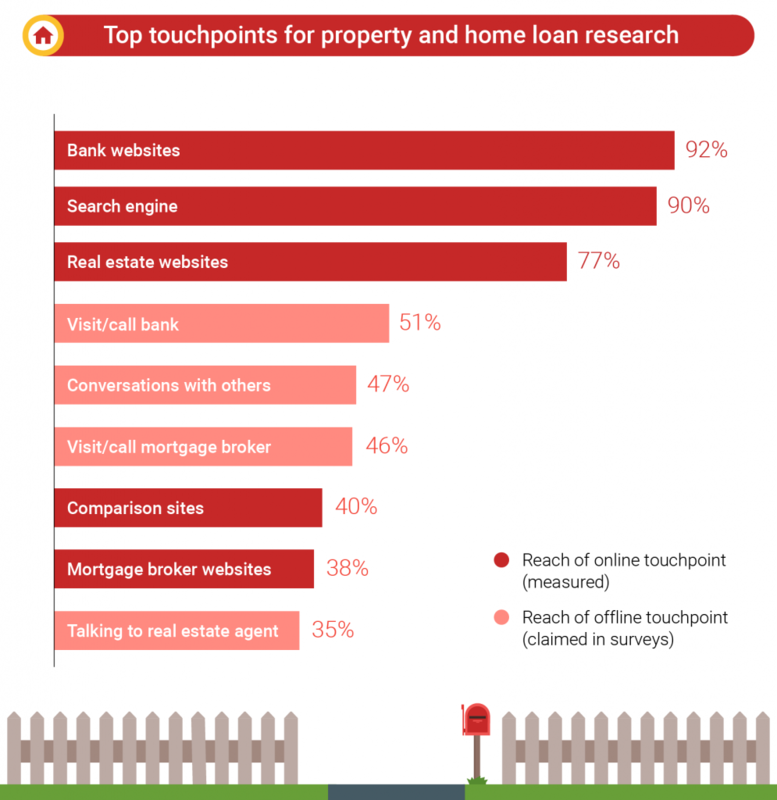 By targeting property and real estate-related queries on search, financial providers can show up early with relevant, helpful information before consumers indicate they’re ready to apply for a loan. There’s a lot to consider before filling out a loan application, including interest rates, monthly payments, customer service, and fluctuations in the housing market. While many consumers still like to speak with brokers or friends and family for advice, digital offers them the convenience of researching on the go or outside normal business hours. We saw this firsthand in our study—consumers spend 70% of their time researching online, 30% of which is spent on mobile. In these moments, consumers are wide open to considering new brands. In fact, many said they were still considering between two and three brands as they neared the final stages of finalizing their loans. This lack of brand loyalty isn’t exclusive to new customers. Half of all consumers end up taking out a loan from the bank they’re currently with. That means the first time a bank even finds out one of its current customers is in the market for a home loan, it may be too late. Most of consumers’ crucial decision-making occurs long before a provider has entered the picture. To win their attention and loyalty before they step in the door (or move onto another bank), financial providers should focus on reaching consumers early with relevant search ads and bolstering their online presence with helpful information, such as fees, rates, customer service, and rewards or benefits. Between the excitement of owning a home and the stress of making such a large, complex purchase, people are in an emotional mindset while they’re researching loans. It’s an incredibly daunting process and Aussies want to arm themselves with as much helpful information and as many resources as possible. That’s why, on average, most consumers in our study (51%) spend more than 22 hours bouncing between touchpoints and multiple devices to reassure their decision-making, amounting to 460 unique research moments. Another telling trend is Aussies’ growing usage of online home loan calculators. As more consumers look to understand what length and type of loan they can afford, calculators now make up the majority of all search traffic for home loans. Just two years ago, we saw a near-equal amount of search interest for queries related to personal loans as home loan calculators. Along with consumers’ growing search interest in home loans and mortgages (+69% YoY in Q2), it’s clear that more Aussies are going online to self-educate and equip themselves with in-depth knowledge about the process. 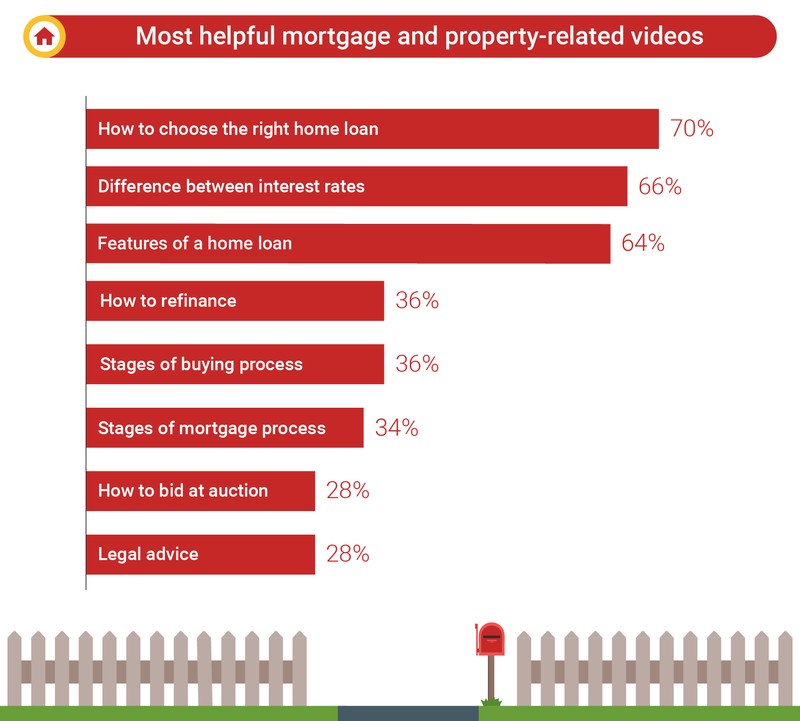 Video content is another way consumers educate themselves on anything from choosing the right home loan to learning how to refinance. While only 16% of consumers currently use videos during their research, 34% said it would have been helpful. Consumers want to feel like an experts before they reach out to financial providers. Developing informative video content is a great way to offer help and guidance as people are considering their options, but great customer service doesn’t stop at the final sale. Financial providers should make it easy for consumers to find ongoing support across platforms and devices, such as help with calculating their loan terms or re-evaluating their mortgages and debts. Buying property can be intimidating, but digital has made it much easier for savvy Australian consumers to navigate the process. Though they’re more self-educated than ever before, consumers still want support and reassurance from experts in the field. 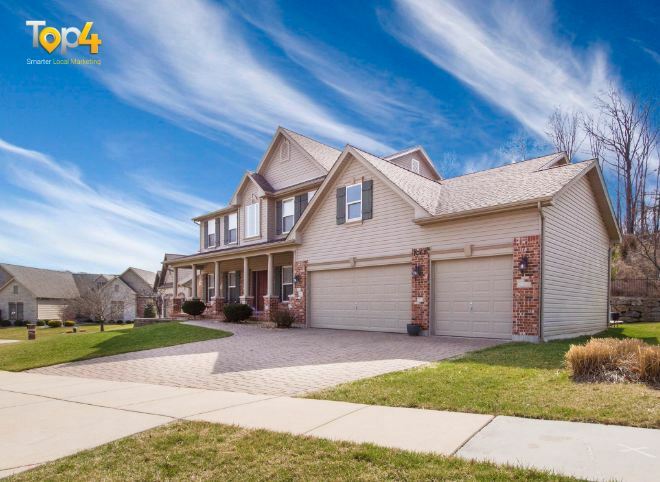 By reaching them across devices with relevant, easy-to-discover financial resources and informative video content, marketers can get one step closer to sealing the deal with prospective home buyers.